This vignette reviews a departmental strategy to manage large and growing student numbers involved in WIL experiences, whilst considering how limited existing resources can be best utilised. Average 400+ student work placements per year. Three WIL course options (electives) available to all students in the Department; students must complete at least one option, linked to their major. Industry Experience 250 hours of workplace experience across a number of organisations; experience must be documented; no assessment, no credit points toward their program. Minimum pre-requisite for graduation. A three-level WIL course offering, ranging from 0 credit points to 20 credit points see framework in the vignette discussed below. Industry Experience no formal assessment; no credit value. Students must register a placement/s linked to their major; complete 250 hours, present a letter of evidence; a time log and an Overview of Student Performance. WIL Practicum 10 credit points over one semester, supported and directed placement. Formal assessment is a Reflective Practice Journal, a Critical Incident paper and Workplace Issues seminar presentation. All three WIL course options can be paid or unpaid placements. All payments go direct to the student. Hotel/ Hospitality sector is more likely to pay; other sectors tend to be non-paid placements. Some organisations assist with accommodation, travel, and other out-of-pocket expenses. Currently trying to negotiate paid internships and scholarships for final year students. Industry Liaison Officer (ILO); administrative position, level 5. Some student supervision by ILOs; no budget for additional academic supervisors. Workplace supervisors (organisation mentors) are not paid positions. No resources available to pay workplace supervisors. Placements mostly on a one-to-one basis between student and workplace supervisor. The following vignette looks at the WIL strategy developed for the Department of Tourism, Leisure Hotel and Sport Management to ensure all students in the Department graduate with some level of workplace experience. This was to be managed in an environment of increasing student numbers and limited resources for WIL supervision. The increasing emphasis on WIL activity across Australian universities will require a review of resource allocation by many institutions to effectively implement the plans for expansion of WIL courses. Whilst many institutions are addressing the issues at the macro level through strategic planning objectives and policy development, resources related to placing, supervising and managing larger student numbers in industry, and the associated academic and administrative workloads, will need attention at the program level. The following case looks at the initiatives taken to address these issues in a recently established Department of Tourism, Leisure, Hotel and Sport Management within the Griffith Business School. The Department is the outcome of an amalgamation of several programs linked to the leisure industry sector, with programs at both the Gold Coast and Brisbane (Nathan) campuses. The Department is in a growth phase with some 1300 students; 30% of the enrolments come from international students. 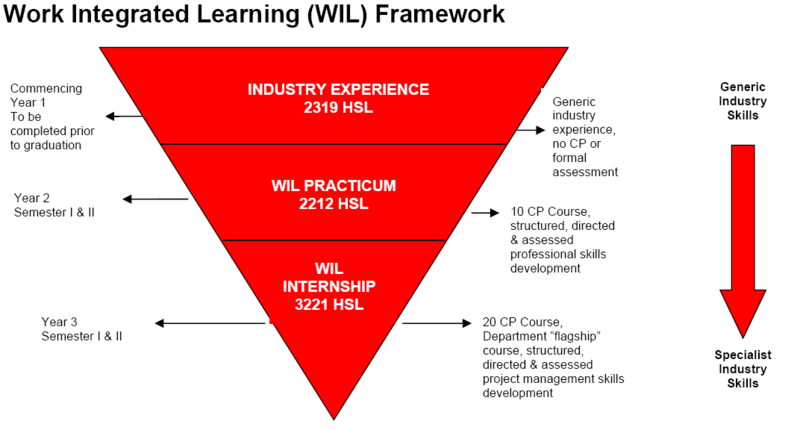 The program has been designed to ensure that every TLHSM student has some level of workplace experience as a pre-requisite for graduation (reflecting a Departmental objective, and Griffiths Strategic Plan for WIL) The three-tier WIL Framework facilitates a choice of progressive learning opportunities; from introductory industry experience, to structured and directed practica, to a final year project-based internship. Students must complete at least one tier of the program. Students who elect to complete all options can progress their learning from generic workplace skills to specialist industry skills and competencies. The Industry Experience option caters to a majority of students in the Department. This option is particularly appealing to students from the hotel, hospitality and tourism majors who are often working part-time in the industry to support their studies. There is a shortage of casual staff for the growing tourism industry in south-east Queensland. Similarly, international students often have a preference to complete their industry experience in their home country where they will eventually seek employment. This option also helps overcome some of the confidence and language issues associated with placing international students in local companies. As this option does not require directed study or supervised assessment, the location of the host workplace can be very flexible. Students are required to register their placement, complete time logs, seek a reference on company letterhead, and negotiate an Overview of Students Performance, as required evidence of completion. WIL Practicum and WIL Internship are supported and directed work placements with negotiated learning objectives and outcomes. These options are often chosen by students who are seeking a specific learning experience or career oriented outcome linked to a targeted company (e.g., to learn the event management process within a high profile organisation or to work with organisation staff known for their mentoring capabilities). The placements are often unpaid, but more focused on the learning needs of the student. Academic learning support, assessment and program credit are attached to these options. The smaller numbers (e.g., approximately 100 students in a WIL Practicum class) enable the limited staff resources (WIL course convenor and ILO staff) to be better focused on learning and teaching and administrative support for these students in credit linked courses. We give great support for students at all three levels of the WIL framework. There are well developed and well managed processes for each level, linked to other internal support services such as the Universitys Career and Employment Service. WIL Workbooks and other support material are continually reviewed to ensure that both the student and the host workplace are well informed on procedure, expectations and support mechanisms in place. The emphasis has been to move responsibility for negotiating, documenting and managing the placement process toward the student. This enables WIL staff to take a more supportive and mentoring role rather than directive. This also frees up more time to support those individual students who are anxious and struggling to make the professional links and transitions to the workplace. The new framework is in its third year of implementation and appears to be coping with the increasing numbers of students. However, there are a significant number of students who have not yet declared their major or their WIL option. This may result in a high level of demand for placements in the latter half of 2008-2009. We are implementing strategies to engage with first year students on their WIL options and begin the professional development process at an early point in their study program. Academic staff in the Department no longer have a workload allocation for supervision of WIL students. This is a constraint to involving interested academic staff in the WIL program and places the responsibility for supporting and directing WIL placement on the WIL course convenor and ILO staff. The Departments ILO staff will have to take more responsibility for the management and monitoring of students on placement. This staffing resource problem is not uncommon in WIL programs across the university sector. What will be the future roles of academic staff and ILO staff in WIL student supervision? How to manage the growing demand for placement support from Industry Experience students? Should WIL courses be core or elective in program majors?